Quintero Berkley and Linda Wiley roleplay as they learn home caregiving skills through the Schmieding Home Caregiver Training Program. 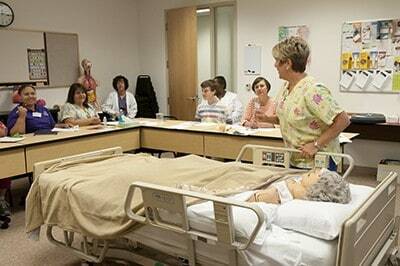 A Schmieding Home Caregiver Training Program instructor discusses a caregiving procedure with a class of students. Aug. 25, 2015 | Aug. 25, 2015 | In another act of philanthropy to the University of Arkansas for Medical Sciences (UAMS) before ceasing operations, the Donald W. Reynolds Foundation has given a $7.9 million grant to the Schmieding Home Caregiver Training Program. The $7.9 million grant will support operations for five years at the Schmieding program’s seven training sites around Arkansas. The program provides education and skills training to family members and paid caregivers caring for older adults in the home, allowing older adults to have choices about how they are cared for. Every day, 10,000 American baby boomers turn 65, and the number of retirees will double in the next decade. The training and education of home caregivers through the Schmieding program means families will have the option of keeping their loved one at home, called aging in place, instead of having to move them to an assisted living or a skilled-nursing facility. It will also provide a better-prepared workforce and establish a pipeline that paid caregivers can use to advance in their work in health care. The program provides dementia training for paid caregivers as well as family caregivers, which is critical now that people are living longer. More than 5 million people in the United States have age-related dementia. According to the recent study Caregiving in the U.S, sponsored by the National Alliance for Caregiving and the AARP Public Policy Institute, of those caregivers providing 21 or more hours of care per week, 84 percent said they could use more information on or help with caregiving topics. The training program was inspired by Lawrence H. Schmieding, who 20 years ago struggled to find competent, compassionate home care for an older brother with dementia. In 1998, the Schmieding Foundation donated $15 million to UAMS to establish and support the Schmieding Center for Senior Health and Education in Springdale, which developed the curriculum and training program. After its initial success in Springdale, a $2.9 million grant from the Reynolds Foundation in 2009 to the Arkansas Aging Initiative, a program of the UAMS Institute on Aging, helped replicate the Schmieding Caregiver Training program in Jonesboro, Pine Bluff, West Memphis and Texarkana in its first phase. A phase II grant of $7.7 million in 2012 from the Reynolds Foundation sustained the initial programs and added four more sites in Fort Smith, Little Rock, Hot Springs and El Dorado. Robin McAtee, Ph.D., has led development of this initiative since the beginning of Phase I and will continue to do so. One of the largest private foundation grants UAMS has received this year, this final grant brings the Reynolds Foundation’s total giving to the Schmieding program to more than $18.5 million. With this most recent grant, the foundation will have given $97.5 million to UAMS, with $94.3 million of that going to the UAMS Donald W. Reynolds Institute on Aging, which includes the caregiver training program. This makes the Donald W. Reynolds Foundation one of the largest donors in UAMS history. The Donald W. Reynolds Foundation is a national philanthropic organization founded in 1954 by the late media entrepreneur for whom it is named. Donald W. Reynolds was the founder and principal owner of Donrey Media Group. When he died in 1993, the company included more than 70 businesses, most in the communications/media field. Headquartered in Las Vegas, the Foundation has committed over $265 million to improving the lives of elderly people in Arkansas and throughout the United States.